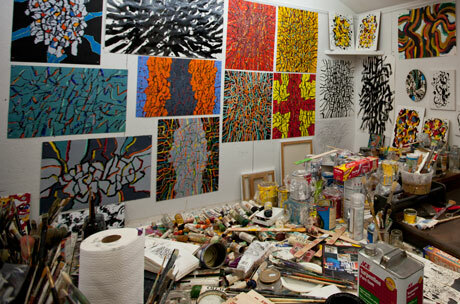 Roger Martin in his studio, Rockport, MA. Roger was born in the Addison Gilbert Hospital in Gloucester, MA, the son of Capt. Roger Martin and Ellie Emilia Oker, in 1925. His father was born in Rockport, of Portuguese heritage, and his mother was born in Finland. He graduated from Rockport Highschool in 1942. While in high school Roger prepared lobsters for tourists at the Roy Moore Lobster Company on Bearskin Neck and sang and played harmonica with Tony Torissi’s hillbilly band. Roger enlisted in the U.S. Coast Guard in 1942 and mustered out in 1946, ending his military career as a member of the USCG canine corps only two weeks from going to the Pacific with a Marine detachment. After having lived on both coasts (Manhattan and Los Angeles) he returned to his home town from the West Coast, vowing to never leave again, and he hasn’t. When he returned to Cape Ann he entered the School of the Museum of Fine Arts in Boston where he majored in book design and illustration, graduating with honors. He illustrated a number of textbooks for D.C. Heath, Beacon Press, and other Boston publishers, as well as provided illustrations for the New York Sunday Times, the New Yorker magazine, the Atlantic Monthly magazine, and a book for the United Church of Christ. Roger also designed, carved and gold-leafed pipe shades for a number of C. B. Fisk pipe organs, builders of tracker action pipe organs, including those at Harvard and Stanford Universities. He began his teaching career in Rockport, teaching elementary grade art, following that with four years teaching at the New England School of Art in Boston. 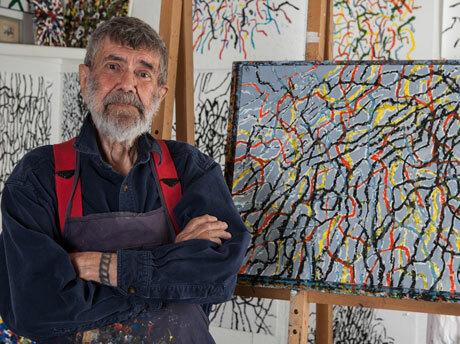 Roger became a founding faculty member of the Montserrat College of Art in Beverly, MA, where he taught for twenty years, retiring to make paintings. Roger married Joan Fertig in 1954, and they had three children; Christopher, Rachel, and Mari. Joan died in 1989, and Rachel passed on in 2002. He married Ann O’Grady in 1990, thus becoming a member of the extensive O’Grady clan. Christopher and his wife Elizabeth had four children, Joseph, Gayla, Jessica, and Ronnie. One of whom (Joseph) presented him with his first great-granddaughter, River Martin. Rachel had two children, Leah and Gregory. Ann died in 2009 and his daughter Mari moved in with him from Santa Barbara, CA in 2010. Roger Martin’s studio, Rockport, MA. Roger has served Rockport in a number of capacities. He was a deputy forest-fire warden, firefighter in the Speedwell Engine Company #2 in Pigeon Cove, retiring as Captain, and was elected to the Planning Board and appointed to the Board of Appeals. He was also elected Rockport’s Poet Laureate in the 1990s and in addition wrote and published three books about Rockport. In recent years, he has managed to keep his brushes in use as he had made a series of works that reflect the Rockport where he grew up: a small town that fished the sea and mined granite from the quarries still to be seen throughout the wooded areas. One can still find quarried blocks of granite dotting the woods in the Pigeon Cove section of town; many of them containing chisel marks put in by hand in the quarrying process, long before the advent of power tools. Rockporters call these leftover granite piles “grout”. Many of Martin’s works feature interpretations of these marks in his mostly abstract works. This and the great Atlantic Ocean are some of his greatest inspirations. Roger Martin has exhibited his work throughout New England and beyond. He has shown his work in Portland, ME; New York City; Andover’s Addison Gallery; the Boston ICA; galleries on Newbury Street in Boston; the Rockport Art Association; the Cape Ann Historical Museum (where he is part of the permanent collection); and many others. His work is represented in many private collections, including those of John Updike, Bernard and Ninon Chaet, and Ralph Coburn. Roger passed away on March 14, 2015. © 2018 Roger H. Martin. All Rights Reserved.